​Roughly 45 percent of surveyed Harvard faculty reported feeling neither satisfied nor dissatisfied with the choice of Lawrence S. Bacow as Harvard’s next president. This is the fifth installment in a five-part series analyzing the results of The Crimson’s survey of the more than 1,000 members of the Faculty of Arts and Sciences, Harvard’s flagship faculty. Read the first installment here, the second installment here, the third installment here, and the fourth installment here. 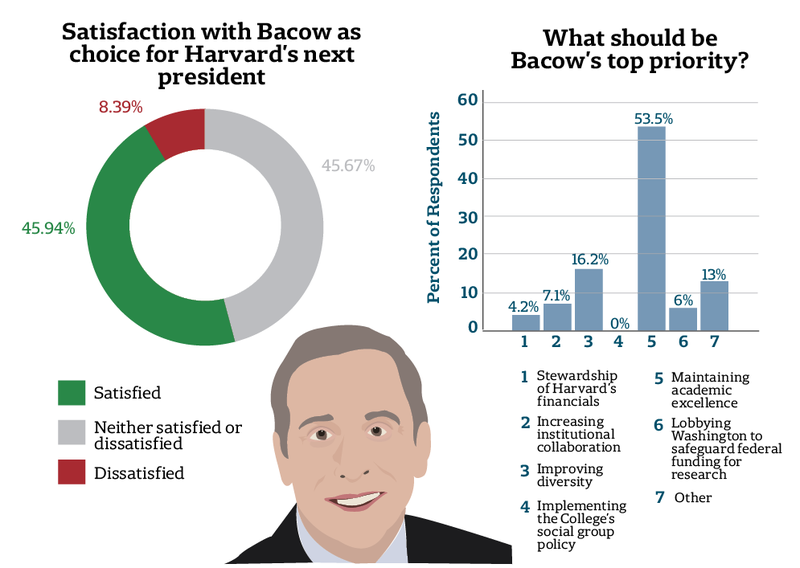 Roughly half of faculty in the Faculty of Arts and Sciences are neither satisfied nor dissatisfied with the choice of Lawrence S. Bacow as Harvard’s next president, according to a survey of the faculty conducted by The Harvard Crimson. Another roughly half of surveyed professors indicated they view the choice to place Bacow in Massachusetts Hall’s corner office with some degree of satisfaction. Asked whether Bacow should continue or veer from the policies of his predecessor University President Drew G. Faust, a plurality of respondents—representing slightly more than a third of survey takers—called for change. The search committee charged with selecting Harvard’s 29th president announced Bacow as their pick in February following a highly secretive nine-month process. Bacow, a former president of Tufts University, sat on the search committee in his capacity as a member of the Harvard Corporation. He quietly recused himself from the committee—comprising Corporation members and three members of the Board of Overseers—in December to become a candidate. Bacow will take office after Faust steps down at the end of June. The Crimson conducted a survey of Harvard’s flagship faculty over the course of two weeks in mid-April 2018. The results paint a picture of how the more than 1,000 members of FAS think about key University policies, life at Harvard, and the national political climate. The fifth and final installment of The Crimson's faculty survey series examines how professors view Bacow and what they see as the biggest challenges he is likely to face as he prepares to assume arguably the most high-profile job in higher education. The Crimson reweighted data reported in this story by respondents' ladder status and divisional affiliation (see below for methodology). Surveyed faculty were evenly split between those who felt indifferent and those who felt pleased with Bacow's selection—roughly 46 percent reported they felt "neither satisfied nor dissatisfied" while another 46 percent indicated they felt either "slightly," "moderately," or "extremely satisfied" with the pick. 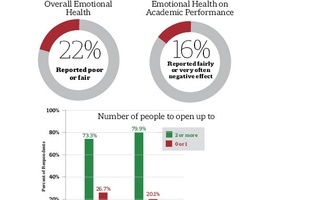 A very small percentage of surveyed faculty indicated they are dissatisfied with Harvard's final choice; approximately 3 percent reported feeling slightly dissatisfied, 4 percent reported feeling moderately dissatisfied, and 1 percent reported feeling extremely dissatisfied. Of surveyed professors who reported their divisional affiliations, those hailing from the Social Sciences were most likely to rate Bacow favorably overall. Just over 19 percent of respondents in that group indicated they are “extremely satisfied” with his selection. When asked what they believe Bacow should prioritize as he assumes office, more than half of faculty respondents said “maintaining academic excellence” should fall at the top of his to-do list. Just over 16 percent of respondents responded that improving Harvard’s diversity should be the president's premium priority. No faculty members indicated that implementing the College’s social group sanctions should comprise Bacow’s first priority. Male respondents overwhelmingly saw academic excellence as a priority—more than 60 percent selected this option—while 25 percent of female respondents chose diversity as their top issue. About 11 percent of males did the same. Those who reported an affiliation with the Arts and Humanities and Social Sciences were more likely to select improving diversity than were faculty who reported an affiliation with other divisions. Further, respondents who identified as tenured professors were more than 25 percent less likely than were self-identified tenure-track professors to prioritize improving diversity. Asked whether, in general, they would prefer to see Bacow stay the course on Faust’s policies and priorities or change direction, a plurality of faculty respondents—39 percent— voted for change. Thirty-three percent voted for continuation and 28 percent reported no opinion. Asked what they believe to be the biggest challenge facing Bacow as he enters office, nearly 55 percent of respondents pointed to the political climate in the United States. National attitudes toward higher education have soured in recent years, with a Pew Research Center study in July 2017 indicating that 58 percent of Republicans believed that universities had a negative impact on the country. 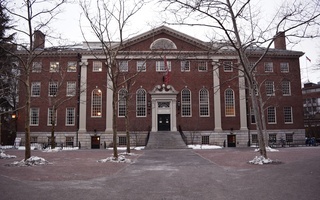 In December, congressional Republicans passed a tax on endowment returns for certain universities, including Harvard, as part of a sweeping tax overhaul. The tax would have cost the University $43 million if it had taken effect during the 2017 fiscal year. Faust lobbied extensively against this tax prior to the vote, and she is now backing draft legislation that would repeal it. One of Bacow’s first responsibilities as president will be selecting a new dean for FAS. The current dean, Michael D. Smith, announced plans in March to step down once Bacow identifies a successor. Nearly 38 percent of faculty survey respondents reported believing Smith’s replacement should prioritize diversifying faculty hires. More than half of self-identified tenure-track and non-ladder faculty respondents said this should form the new dean’s top priority. 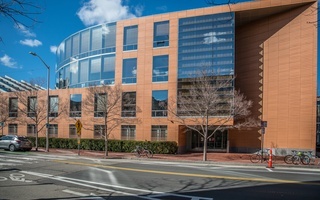 Overall, few respondents reported viewing the expansion of SEAS into Allston in 2020 as a pressing concern for the next FAS dean. No faculty who reported an affiliation with the Social Sciences indicated this should be the dean's top priority. Forty percent of faculty who reported an affiliation with the SEAS division also labeled the Allston move a priority for the next dean. The new SEAS complex is scheduled to open in 2020. The University has already begun adjusting class schedules and determining transit options to move students between Cambridge to Boston for classes. Presidential searches have historically served as turning points and moments of institutional reflection at Harvard. During the search for number 29, committee members sent emails soliciting input from more than 375,000 people, individually consulted 250 people, and worked with three advisory committees comprising students, faculty, and staff to inform its priorities and candidate list. The overwhelming majority of faculty who responded to The Crimson’s survey—nearly three quarters—reported they were not personally consulted during the presidential search. Of those who indicated the search committee reached out to them, 45 percent identified themselves as affiliated with the Social Sciences division, while only 8 percent identified themselves as affiliated with the School of Engineering and Applied Sciences. Nearly 60 percent of the people who reported being contacted indicated they are tenured professors, while 75 percent of self-identified tenure-track professors and nearly 88 percent of self-identified non-ladder faculty members indicated they were not personally consulted by the search committee. Asked whether they believed the University's presidential search process was sufficiently transparent, more than half of surveyed faculty reported feeling neutral. Search committee members maintained strict secrecy throughout the hunt for Faust's successor. The Harvard Crimson collected electronic responses through the Qualtrics survey platform from April 17 to April 30, 2018. A link to the anonymous survey was sent to 1,173 FAS and SEAS faculty members through emails sourced from Harvard directory information and departmental websites. Of those faculty who received emails, 516 accessed the link to the survey. A total of 498 participants answered at least one question, and 296 participants completed every question in the survey. To prevent participants from accidentally taking the survey more than once, The Crimson enabled Qualtrics’ browser cookie functionality to register unique survey sessions on each device. This device data is controlled by Qualtrics, and The Crimson does not retain information that could identify devices accessing the survey with anonymous responses. In an effort to check for response bias, The Crimson compared respondent demographics with publicly available information on faculty demographics provided by the University—information regarding gender, minority background, divisional affiliation, and ladder versus non-ladder status. Overall, respondent demographics tracked with faculty demographics. Of survey respondents who identified themselves as ladder faculty, 34.5 percent were women and 16.2 percent were minorities. Based on data in the 2017 FAS Dean’s Annual report, women and minorities make up 29.9 percent and 21.9 percent of FAS ladder faculty, respectively. The Crimson previously reported that, in May 2015, 28.9 percent of the FAS were non-ladder faculty. By contrast, 42 percent of respondents to The Crimson’s survey identified themselves as non-ladder faculty. Of faculty with known divisional affiliations who were sent links to the survey, 317—or 28.5 percent—are affiliated with the Arts and Humanities, 341—or 30.6 percent—with the Social Sciences, 316—or 28.4 percent—with the Sciences, and 140—or 12.6 percent—with SEAS. In comparison, of respondents who indicated their divisional affiliation on the survey, 39.9 percent reported an affiliation with the Arts and Humanities, 27.8 with the Social Sciences, 28.26 percent with the Sciences, and 7 percent with SEAS. The Crimson reweighted all responses by ladder status and divisional affiliation—the two demographic categories which saw the most significant areas of response discrepancy. These reweightings did not produce any changes greater than plus or minus 2.5 percent from the unadjusted percentages. Separately adjusting by gender or minority background yielded no changes greater than plus or minus 0.7 percent to the unadjusted percentages. Therefore, The Crimson did not reweight responses by these two categories. The data reported in the main body of the story thus does not include any reweightings for gender or minority background. American young people agree that political discourse has become less civil in the last five years, according to an Institute of Politics survey.